On River Time D301WW. 2/2 in a Fabulous riverfront community! Beautifully decorated 2/2 condo sleeps 6 at Waterwheel Condominiums overlooking the rolling green grass, huge shade tress and a riverside pool along the scenic Guadalupe River near the convergence of the Guadalupe and Comal rivers. 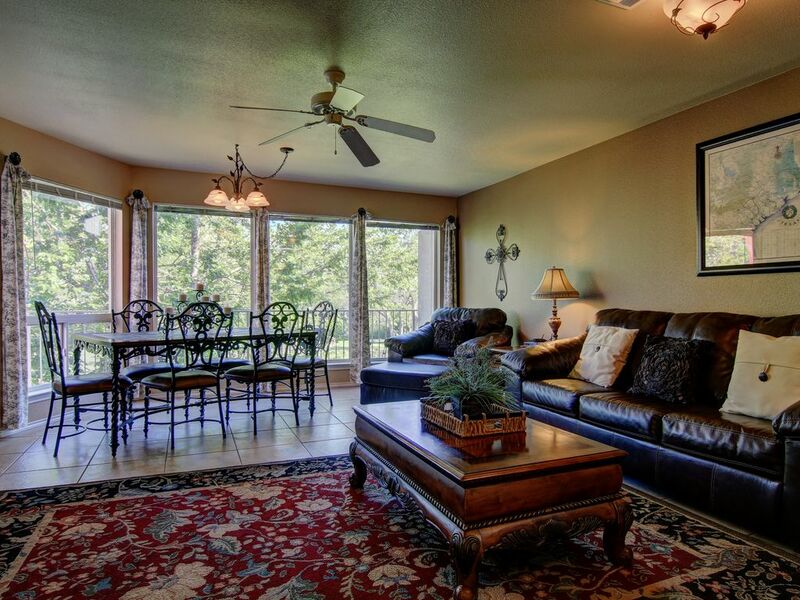 This 3rd floor condo has a spacious open living/ dining room. This third floor condo offers 2 bedrooms, both with a King size bed and a brand new sleeper sofa in the living room. Dining table seats 6 and there are 2 bar stools at the breakfast bar. Every room has flat screen TVs with Cable and free WiFi. Fully furnished and equipped with everything you would need for a wonderful vacation. High quality linens are provided for all beds and bathrooms.This complex also offers 2 pools, 4 hot tubs, charcoal grills and lush, rolling green space for that resort, get-away feel. Relax on the patio with a glass of wine and let your cares float away! Rockin' R River Rides will pick up right next door and can take guests to float the Comal or the Guadalupe River between Memorial Day to Labor Day. For any reservation outside of those dates, the shop is only .7 miles away. You can float down the Guadalupe River and get out right by this condo. Walking distance to the famed Schlitterbahn Water Park and less than 1 mile from downtown. Less than 3 miles to historic downtown Gruene. 2 parking spots provided. This condo is on the third floor and does have an elevator. Guests must be 25 years of age or older to make a reservation and must be staying at the property. No pets allowed. You will receive 2 parking passes and 6 wristbands (max amount allowed). Our experience in this unit was perfect! It was nicely decorated, the beds were very comfortable, complimentary shampoo, conditioner, soap and lotion were provided. I was very happy to see a hair dryer as I had forgotten mine! That was a bonus. There was some trouble with the internet and they came out and fixed it promptly. The unit has a great balcony overlooking the beautiful grass, pool and the river. My kids were thrilled with the pool and how close we were. It was a very short walk to Schlitterbahn for those coming during open season. Overall, excellent experience! Would definitely recommend! This rental experience does not receive a high rating. The biggest disappointment was how dirty the LR area rug and the bedroom's carpet was. Overall the whole condo could use a thorough cleaning. I was also surprised at how little supplies were furnished. There was no hand soap, tissues, cleaning supplies, and 4 hangers per closet. There were two blenders, one didn't work and the other made a "chunky" smoothie. Ended up buying one, so now there are three. The property management responded to us promptly. Hi David, I am sorry your experience was not up to your expectations. We provide a "starter kit" with TP, hand soap, ect. I apologize that the cleanliness of the unit was not top notch and I will speak to our cleaning crew immediately. If you would have told us about the hanger and blender we would have promptly supplied those for you. We hope you will give us another chance in the future to provide you with the perfect New Braunfels Escape!! New Braunfels Escapes is the best! Great condo! Very clean and inviting. Had all the comforts of home. We loved thee pools and hot tubs, and bbq grills. We were walking distance from Schliterbahn, the Comal River, and the Guadalupe. The professional team at New Braunfels Escapes really took care of our every need, thank you! We cant wait to return!!! Happy with the location. Not very pleased with the unit, the connecting doors between the adjoining unit did not block the noise. The din was very loud and annoying at time. Loved the resort. The rooms were spacious and it had a great view. Kids loved the pool and being able to walk to river so easily. The property manager was extremely helpful and her customer service was excellent. It was wonderful. Everything was very clean and well kept. We were very happy. The only problems we had were an issue with the sleeper sofa and the coffee pot. Otherwise it was fantastic.